Look what I did! I baked! I made the most gloriously delicious cupcakes. It could be because I've limited myself to one sweet per week and the taste of sugar in my mouth was just indescribable or it could be because this is just an awesome cupcake. I think it was a bit of both. These weren't meant to be Valentines cupcakes hence the mismatch yellow liners and Valentines sprinkles. I found the cute cupcake liners at Michael's in their dollar section. The sprinkles were in my stash, I'm pretty sure they are Wilton. See how pretty these turned out? Combine the cocoa, flour, sugar, soda, baking powder and salt in a bowl. Add the rest of the ingredients and mix till combined scraping down sides of bowl as needed. Scoop batter in liners and fill one-half to two-thirds full. (Be careful here!) Bake in a 350 degree oven for 15-20 minutes or until top of cupcake springs back when lightly touched. Let cool completely before frosting. Makes approx. 18 cupcakes. Note: Do Not overfill your liners on this recipe. They will over flow. For this cuppie I used Martha's Swiss Meringue Buttercream. 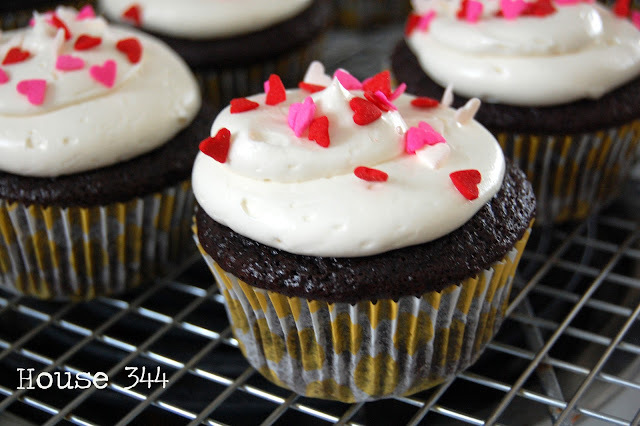 If you've never tried this frosting before, you have to give it a try! It's so much smoother and much less annoyingly sweet than a regular buttercream. It does take a little more work but it's so worth it. I halved this recipe for one batch of One Bowl Chocolate cupcakes. Combine egg whites, sugar, and salt in the heatproof bowl of a standing mixer set over a pan of simmering water. Whisk constantly by hand until mixture is warm to the touch and sugar has dissolved (the mixture should feel completely smooth when rubbed between your fingertips). Attach the bowl to the mixer fitted with the whisk attachment. Starting on low and gradually increasing to medium-high speed, whisk until stiff (but not dry) peaks form. Continue mixing until the mixture is fluffy and glossy, and completely cool (test by touching the bottom of the bowl), about 10 minutes. With mixer on medium-low speed, add the butter a few tablespoons at a time, mixing well after each addition. Once all butter has been added, whisk in vanilla. Switch to the paddle attachment, and continue beating on low speed until all air bubbles are eliminated, about 2 minutes. Scrape down sides of bowl with a flexible spatula, and continue beating until the frosting is completely smooth. Keep buttercream at room temperature if using the same day. These look so yummy! I have been in cupcake mode lately, so I should give these a shot. Thanks for sharing the recipe! Monica, these look delicious! I love your site, btw!